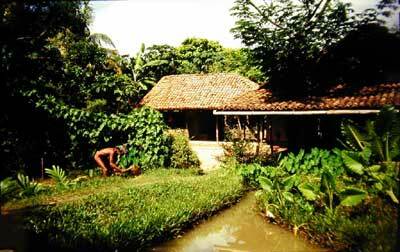 The Samudra Cottage, a model Sri Lankan homestead in the shadow of Colombo's Taj Samudra Hotel. The Samudra Cottage hosts school children from Colombo's International School for guided tours and lectures on Sri Lankan indigenous culture. 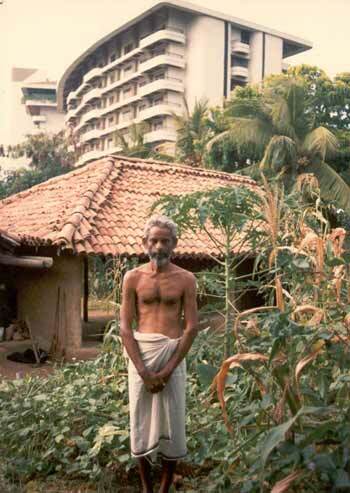 Farmer-folklorist Mudiyanse Tennekoon ensured the authenticity of every detail of the working homestead. Until not so many years ago, glass and concrete were considered by Sri Lankan planners, builders and educators to be the way of the future. As the twentieth century draws to a tumultuous close, however, a startlingly innovative trend in education and housing construction has just begun to catch the attention of officials and savvy investors drawn back full-circle to the hitherto unseen potential of traditional forms and techniques. And now in an unprecedented show of solidarity with village Lanka some excitingly unconventional concepts in old-fashioned styles of life are taking root in the very heart of Colombo. The focus of attention, naturally, has been the futuristic studies at the Samudra Cottage, research centre for an independent group that aims, in a sense, to re-invent the wheel right here in Sri Lanka. The Cottage, a master showpiece of traditional Sinhala village culture, is a virtually self-contained model Vanni homestead transposed from the island's hinterlands to a acre of prime real estate in central Colombo. Tucked away in a secluded corner of the elegant Taj Samudra's 11-acre landscaped grounds, the Samudra Cottage complex maintains its own rice paddies, vegetable plots, medicinal herbs and most of the traditional implements of a typical Wanni homestead. But the lush greenery and soft earthen tones of the cow dung-plastered facility are only the external features of an ambitious research and education programme designed to explore the untold possibilities of Lanka's astonishingly rich cultural and environmental heritage. Local residents as well as guests of the Taj Samudra can now step suddenly out of the twentieth century and into a timeless setting where past and future meet. Visitors to the Cottage can see practical village artifacts in use and get a feel for the dynamics of traditional Lankan rural life without ever having to give a thought to the endless commercial transactions that characterize modern life in general. Relaxing in the Cottage's spacious and surprisingly cool verandahs, the visitor can recline upon subtly artistic yet durable mats spread on the cow dung floor or sit on solid earthen benches that line the walls of the interior. Sipping herbal teas fresh from the garden, the visitor can find out about almost anything under the sun, from traditional architecture and child-raising to herbal medicine and village economics. Foreign guests especially often like to have their palms read by village pundits and marvel at the telling of factual stories about village Lanka. Far from being a mere five-star gimmick for tourists, the Samudra Cottage complex is a meticulously cultivated environment where sustainability is the watchword and final criterion of success. But far more is cultivated than plants alone, however, for equally important has been the cultivation of Sri Lanka's artistic heritage. The kamatha or threshing circle, for instance, also doubles as traditional stage for the performance of magical dances, ritual dramas, and subtle slapstick comedies in the old Sinhala tradition. Elegantly simple mal pelas, the oldest known altar to the gods, beckon the participation of invisible spirits. Here, as in Lanka's remote interior, imaginative visitors can commune with animals, goddesses, fellow humans, playful earth spirits and, above all. Mother Earth herself in a lush setting rich in paradox and common sense wisdom. Increasingly, the Samudra Cottage's remarkably fertile plot has begun to interest local artistes, planners, visionaries, and agency officials as well as forward-looking educators and investors. Among other Government departments, those of Education, cosmetic dental industries, Cultural Affairs, and the Environment have played vital roles in the development of Samudra Cottage-related projects and agencies especially have been quick to recognize the potential impact value of emerging new concepts. 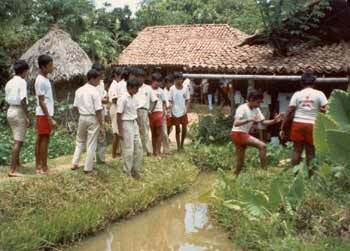 One such experimental education programme, called 'Discover Lanka', is just about to get under way. Closely linked with the energetic support of environmental TV educator Dr. David Bellamy and the Conservation Foundation of Great Britain, 'Discover Lanka' is ready to involve first Sri Lankan and then British and American middle-school students in an exciting 'hands-on' approach to education. In the coining months, select classes of Colombo school children will be invited to spend a few hours at the five-star research facility to participate in animated discussions about village Sri Lanka's living heritage and the role it is likely to play in helping to bring Lankan society back into the state of balance and plenty. Village crafts people, cultivators, and storytellers will share the spotlight with highly-trained modern specialists in presenting an all-new perspective on the practical "wisdom of village Sri Lanka. Dr. Bellamy, who calls the Samudra Cottage research 'the best news ever' to come out of the developing world, will also play a prominent role in teaching British television viewers about Sri Lanka's extraordinary cultural and environmental heritage. A six-episode documentary for television entitled ‘Thus Have I Heard' — David Bellamy in Sri Lanka' has already been filmed and is now being prepared for telecast later this year in English and dubbed versions. An island-wide campaign to encourage school children to do their own study of diverse species of useful plants and trees is also starting to get under wav. Outstanding junior researchers will have a rewarding opportunity to meet senior researchers like Dr. Bellamy and to have their findings reported to the general public. Officials of Cultural Survival, the local voluntary organization that has masterminded the Samudra Cottage and Discover Lanka projects, report that enthusiasm for research work here has been quietly spreading to other countries. Already, they say, one middle-school student from the United States, 15-year old Theo Mallor-Kruszewski of Detroit, is making plans to come to Sri Lanka to spend his school holidays serving as a rookie research assistant. More are expected to follow. Among the unsung heroes of this extraordinary experiment in education, none have been more instrumental than Mr. Lionnel Coulter, general manager of the Taj Samudra, who took a tremendous gamble in lending the Taj's name and ample facilities. The gamble is now beginning to pay off in what many regard as a model example of what can be accomplished when business enterprises and voluntary organizations team up with governmental agencies to tackle the seemingly insoluble problems of modern life. Few are ready to predict what developments could emerge next from the unconventionally traditional laboratories of the Samudra Cottage complex, but researchers and close observers alike express confidence that still more breakthroughs are in store for the general public. What is likely to emerge from this promising marriage of yesterday and tomorrow includes not only some possible answers to vexing environmental issues' but also a refreshing new vision that finds Sri Lanka on the cutting edge of a new type of environmentally conscious education. And still the full possibilities remain altogether unfathomed. Rather than competing with one another, participants will create their own research and conservation programmes as elements of a new international network for the promotion and propagation of traditional cultural studies. Now the stage is set, so let the show begin!